Calcium supplements can interact with several medications in different ways, often increasing or decreasing the amount of the drug that's absorbed. And sometimes it works the other way around — the drug changes how much calcium you absorb. Supplements are usually safe to take, but you need to consider what else you're taking and what's going with your body. It's important to talk to your health care provider about taking calcium, or any supplements if you're on any medications, even over-the-counter medications. Calcium supplements can decrease the absorption of fluoroquinolone and tetracycline. Taking the medications and supplements at least two hours apart should help, but again, speak with your health care provider. Calcium supplements should probably be avoided altogether if you're taking gentamicin, another type of antibiotic. Bisphosphonates are medications used to treat osteoporosis. Taking them at the same time as calcium supplements may decrease absorption of the medication, so they should be taken at least two hours apart from the calcium. On the other hand, estrogens increase calcium absorption, which can improve bone density. Diuretics are used to remove fluid from your body and reduce blood pressure. Some types of diuretics may affect your blood levels of calcium. Potassium-sparing and thiazide diuretics can increase the amount of calcium in your blood, and loop diuretics cause calcium levels to go down. Calcium supplements and beta-blockers may interfere with each other. And, not surprisingly, calcium may interfere with calcium channel blockers. Don't take any calcium supplements with these blood pressure medications unless your healthcare provider tells you to take them. Both aluminum- and magnesium-containing antacids increase the amount of calcium that's excreted in your urine, which means you might lose calcium. And, one form of calcium supplements called calcium citrate, may increase the amount of aluminum that's absorbed from those antacids. Some over-the-counter antacids are made of calcium carbonate, which absorbs the acid in your stomach. It's important to follow label instructions to prevent absorbing too much calcium from these antacids. 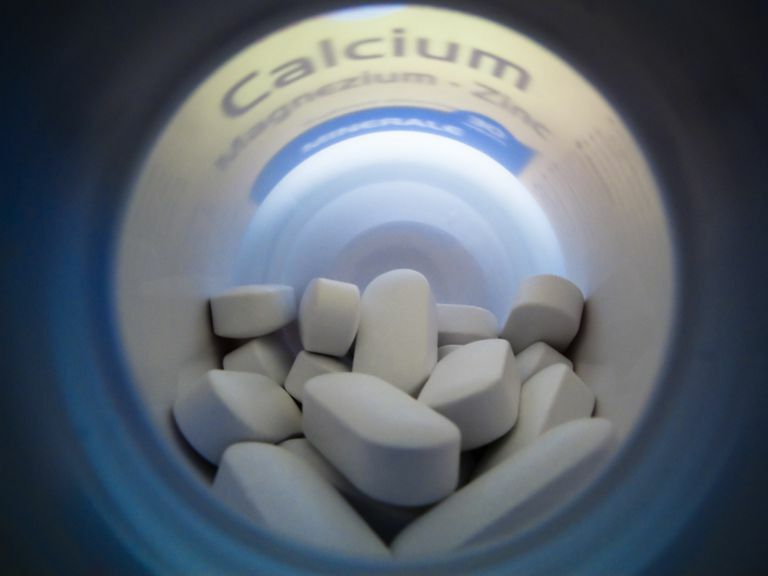 Laxatives that contain magnesium may decrease the amount of calcium absorbed from calcium supplements. Anti-seizure medications, such as phenytoin, carbamazepine, phenobarbital, and primidone, may lower your calcium levels. They need to be taken at least two hours apart from calcium supplements. In addition, your healthcare provider may suggest taking vitamin D along supplements along with your anti-seizure medications to try to keep calcium levels close to normal levels. One type of cholesterol-reducing medication, called bile acid sequestrants, may increase calcium loss in the urine, so your health care provider may recommend taking calcium and vitamin D supplements. Really, this is so important that I'm going to repeat it here. You need to talk to your healthcare provider about any dietary supplements you are taking, especially if you have any health conditions or are taking any medications, including prescriptions and over-the-counter drugs.